- Dragon Gate Battle Station PPV #7 (March 13, '05) = BxB Hulk, Anthony W. Mori, & Magnum Tokyo lost to Don Fujii, Shingo Takagi, & CIMA. - Dragon Gate Battle Station PPV #8 (April 8, '05) = BxB Hulk, Anthony W. Mori, & Super Shisa were beaten by Danshoku Dino, Naoki Tanisaki, & Magnum Tokyo. - Dragon Gate Battle Station PPV #9 (May 11, '05) = BxB Hulk, Anthony W. Mori, & Super Shisa fell to Katsuhiko Nakajima, Susumu Yokosuka, & K-Ness. - Dragon Gate Battle Station PPV #10 (June 22, '05) = BxB Hulk, Anthony W. Mori, & Magnum Tokyo lost to Genki Horiguchi, Ryo Saito, & The Dragon Kid. Later on, BxB Hulk, Genki Horiguchi, Anthony W. Mori, Ryo Saito, Naoki Tanisaki, & The Dragon Kid were beaten by Naruki Doi, Don Fujii, Magnitude Kishiwada, Shingo Takagi, Masato Yoshino, & CIMA. - Dragon Gate Pro Wrestling Festival '05 (July 3) = BxB Hulk, Anthony W. Mori, & Super Shisa fell to Kenichiro Arai, Susumu Yokosuka, & K-Ness. - Dragon Gate Battle Station PPV #11 (August 10, '05) = BxB Hulk, Anthony W. Mori, & Super Shisa lost to the Open The Triangle Gate Champions, Magnitude Kishiwada, Masato Yoshino, & CIMA. - Dragon Gate Battle Station PPV #12 (September 7, '05) = BxB Hulk, Shiori Asahi, Makoto Oishi, & Super Shisa fell to Kenichiro Arai, Katsuhiro Nakajima, Magnum Tokyo, & K-Ness. - Dragon Gate Battle Station PPV #13 (October 5, '05) = BxB Hulk & Anthony W. Mori defeated Shingo Takagi & Masato Yoshino. - Dragon Gate Battle Station PPV #14 (November 2, '05) = BxB Hulk & Katsuo were beaten by Genki Horiguchi & Tozawa. - Dragon Gate Battle Station PPV #15 (December 27, '05) = BxB Hulk & Katsuhiko Nakajima took down Katsuo & Tozawa. - Dragon Gate Battle Station PPV #16 (January 27, '06) = BxB Hulk & Katsuo defeated Tozawa & Vangelis. - Dragon Gate Battle Station PPV #17 (February 24, '06) = BxB Hulk, Genki Horiguchi, & Anthony W. Mori fell to Kenichiro Arai, Jack Evans, & Magnum Tokyo. - Dragon Gate Battle Station PPV #18 (March 17, '06) = BxB Hulk & Magnum Tokyo beat Genki Horiguchi & Ryo Saito. - Dragon Gate Battle Station PPV #19 (April 26, '06) = BxB Hulk pinned Shingo Takagi. - Dragon Gate Pro Wrestling Festival '06 (July 2) = BxB Hulk was pinned by Dos Caras. - Dragon Gate International Junior Heavyweight Tag-Team Titles Tournament (August 6, '06) = BxB Hulk & CIMA beat King Shisa & Super Shisa, then lost to Masaaki Mochisuki & Magnum Tokyo. Mochisuki & Don Fujii won the tournament. - Dragon Gate Battle Station PPV #20 (November 23, '06) = BxB Hulk, Jack Evans, Jushin Liger, & Matt Sydal defeated Naruki Doi, Magnitude Kishiwada, Kevin Steen, & Masato Yoshino. - NJPW Best of the Super Junior '07 (June) = BxB Hulk competed in the league, which was won by Milano Collection AT. 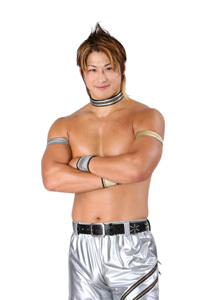 - Dragon Gate Pro Wrestling Festival '07 (July 1) = BxB Hulk, Shingo Takagi, & Cyber Kong retained the Open The Triangle Gate Titles, beating Naruki Doi, Magnitude Kishiwada, & Masato Yoshino. - Dragon Gate The Gate of Generation (March 20, '08) = BxB Hulk & Shingo Takagi lost the NOAH GHC Junior Tag-Team Titles to Taiji Ishimori & KENTA. - RoH Dragon Gate Challenge II (March 28, '08) = BxB Hulk & Shingo Takagi defeated the Age of the Fall (Tyler Black & Jimmy Jacobs). - RoH Supercard of Honor III (March 29, '08) = BxB Hulk & Shingo Takagi won over Kevin Steen & El Generico. - Dragon Gate Pro Wrestling Festival '08 (July 27) = BxB Hulk lost to Shingo Takagi, who won the vacated Open The Dream Gate Title. - Dragon Gate Summer Adventure Tag-Team League '08 (August) = BxB Hulk & Naoki Tanisaki competed in the league, which was won by Naruki Doi & Masato Yoshino. - RoH Battle of the Best (September 13, '08) = BxB Hulk & The Muscle Outlaws fell to SHINGO, El Generico, & The Dragon Kid. - Dragon Gate Pro Wrestling Festival '09 (July 19) = BxB Hulk, Masato Yoshino, & PAC stayed the Open The Triangle Gate Champions, defeating Taku Iwasa, Akira Tozawa, & The Dragon Kid. - Dragon Gate USA Enter The Dragon '09 (July 25) = BxB Hulk was beaten by Yamatao. - Dragon Gate Summer Adventure Tag-Team League '09 (August) = BxB Hulk & Masato Yoshino lost in the semi-finals to Masaaki Mochizuki & Katsuhiko Nakajima. Shingo Takagi & Yamato won the league. - Dragon Gate USA Freedom Fight '09 (November 28) = BxB Hulk pinned Brian Kendrick, then later won a "Four-Way Elimination" Match over Gran Akuma, CIMA, and Yamato to become the first Open The Freedom Gate Champion. - Dragon Gate USA Fearless (January 23, '10) = BxB Hulk retained the Open The Freedom Gate Title, beating The Dragon Kid. - Dragon Gate USA Mercury Rising (March 27, '10) = BxB Hulk, Naruki Doi, & Masato Yoshino took down CIMA, Gamma, & The Dragon Kid. - Dragon Gate USA Uprising (May 8, '10) = BxB Hulk stayed the Open The Freedom Gate Champion, pinning Masato Yoshino. 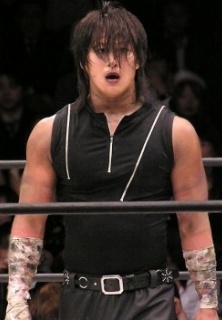 - Dragon Gate Pro Wrestling Festival '10 (July 11) = BxB Hulk lost a "Hair vs. Hair" Match to Shingo Takagi. - Dragon Gate Enter The Dragon '10 (July 24) = BxB Hulk kept the Open The Freedom Gate Title, taking down Masaaki Mochizuki. - CHIKARA Chikarasaurus Rex: King Of Show (July 25, '10) = BxB Hulk & The Muscle Outlaws fell to Mike Quackenbush, Hallowicked, & Jigsaw. - Dragon Gate Summer Adventure Tag-Team League '10 (July/August) = BxB Hulk & Naoki Tanisaki competed in the league, which was won by Naruki Doi & Masato Yoshino. - Dragon Gate USA Untouchable '10 (September 25) = BxB Hulk won a "Three Way" Match over Mike Quackenbush and Akira Tozawa. - Dragon Gate USA Bushido: Code of the Warrior (October 29, '10) = BxB Hulk retained the Open The Freedom Gate Title, beating SHINGO. - Dragon Gate USA Freedom Fight '10 (October 30, '10) = World 1 (BxB Hulk & Homicide) defeated Kamikaze USA (Jon Moxley & Akira Tozawa). - PWG Kurt Russellreunion 3 (January 29, '12) = BxB Hulk fell to Jimmy Susumu.